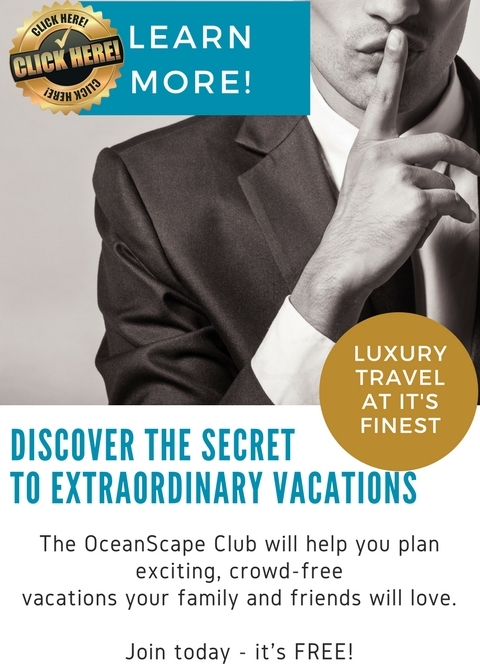 A luxury yacht charter in Costa Rica is like falling headlong into a nature documentary, where rainforest rolls down to the gin-clear sea, volcanoes puff gently across a lush landscape of coffee plantations and rolling hills, and humpback whales play with their calves in pristine waters. On a yacht charter in Costa Rica you might bathe in hot springs at the foot of an active volcano, white water raft down a jungle river, or find the prints of a jaguar on the forest floor. Yet for all its wild splendour, Costa Rica also offers luxury in abundance: designer golf courses, decadent resorts, and world-class marinas. A Costa Rica charter yacht is the ultimate way to explore the Pacific coastline, but you can also explore highlights of the Caribbean coast from your charter yacht via helicopter. Due to a pretty neat weather phenomenon caused by proximity to the equator and the rotation of the earth through space, a hurricane has never made landfall in Costa Rica since records began in 1851, making it one of the safest destinations to enjoy a yacht charter in the region year-round. Having said that, Costa Rica does experience the effects of nearby Caribbean hurricanes such as heavy rain and wind, so is generally to be avoided around the hurricane peak in September, as well as rainy October. The most popular times to visit Costa Rica is during the dry season, which runs from December to April and coincides with plenty of local festivals as well as humpback whales and turtle nesting season. Even in the wet season (May to November), there’s a relative reprieve in rainfall in July and August, making this a great time to go and enjoy the country at its lushest. The Osa Peninsula lies in the deep south of Costa Rica, but it is here we shall begin, for it is one of Costa Rica’s most wild and splendid places—both on and off the water. The Osa Peninsula is home to Drake Bay, which has the longest humpback whale-watching season in the world, running from August right through to March. 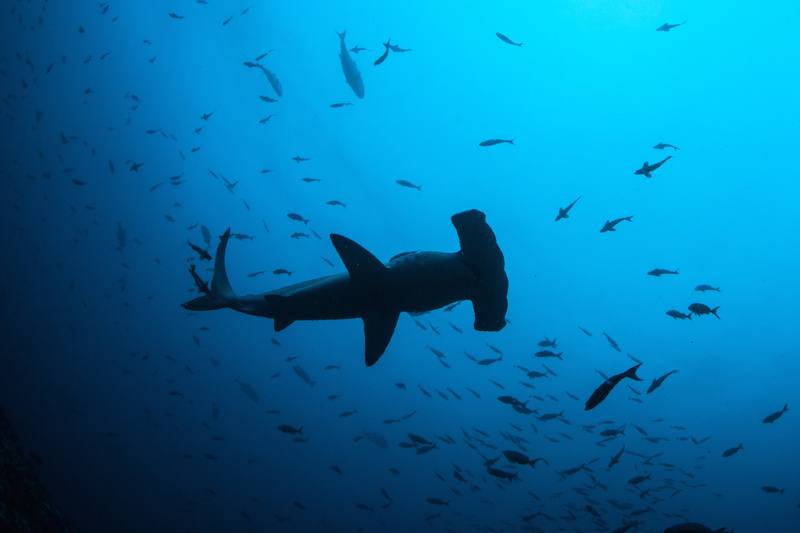 The waters off the Osa Peninsula also teem with other marine life, from dolphins and hammerheads to the massive schools of billfish which make the Osa Peninsula one of the best sportfishing grounds in the Americas. On land, the wild discoveries continue in the mysterious Corcovado National Park, where the bizarre-looking tapirs are found curled up like tiny rhinos in forest clearings, and the luckiest will spot one of the elusive jaguars up in a tree, their spots mingling with the leaves. The Osa Peninsula has opened up to superyachts in a big way since Golfito Marina opened in 2017, making it the largest capacity superyacht marina in the Central American Pacific and the gateway to some of the finest surfing, sportfishing, and wildlife experiences on the planet. One of the most wonderful things about cruising the Pacific Coast of Costa Rica on a superyacht is how much the landscape varies. The Papagayo Peninsula in Costa Rica’s north is a spectacular, protected cruising ground of crescent moon beaches edged by green forest and turquoise water, with only golf courses and luxury resorts interrupting the natural landscape. The Papagayo Peninsula also offers a superb IYC marina, one of the finest luxury yacht ports in the Pacific. The Peninsula is gated and has an exclusive air, with fine hotels like the Four Seasons welcoming you ashore to enjoy the fine dining and spa experience as well as the stunning Arnold Palmer-designed golf course, rated one of the world’s 100 Best Courses Outside America by Golf Digest. There’s also a large nature reserve on the peninsula, with a Trail of the Giants tour winding through a cathedral of trees, with monkeys chattering above and iguanas scuttling through the underbrush. No visit to Costa Rica is complete without a visit to one of its magnificent volcanoes. Located on the rim of fire, Costa Rica has 6 active volcanoes, plus more than 60 dormant or extinct ones. 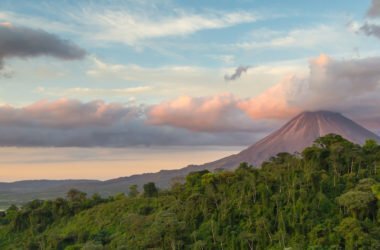 The most famous of them all is Arenal, which last erupted in 1968. The volcano is currently in a resting phase, but visitors to Arenal will keep busy with white water rafting, horseriding through the forest, hiking, and canyoning around the immense volcano. You can even windsurf at altitude (yes, you read that right) on Lake Arenal, one of the world’s top 10 windsurfing sites! After all that activity, you’ll enjoy bathing in the beautiful hot springs that bubble up around Arenal, resting back in the warm waters and looking up at the volcano looming above. Other volcanoes worth visiting include Irazu just outside San Jose, from which you can see both the Caribbean and Pacific Coasts. Considered one of the most beautiful national parks in the world by Forbes, the Manuel Antonio National Park offers picture-perfect beaches and masses of hiking trails into the rainforest, where capuchin and squirrel monkeys play in the canopy, and sloths sleep in tree forks. There’s also a coral reef just offshore for diving adventures from your yacht, incredible sportfishing, and some great kayaking through the mangroves at Dumas Island, looking for crocodiles and monkeys between the twisted branches. 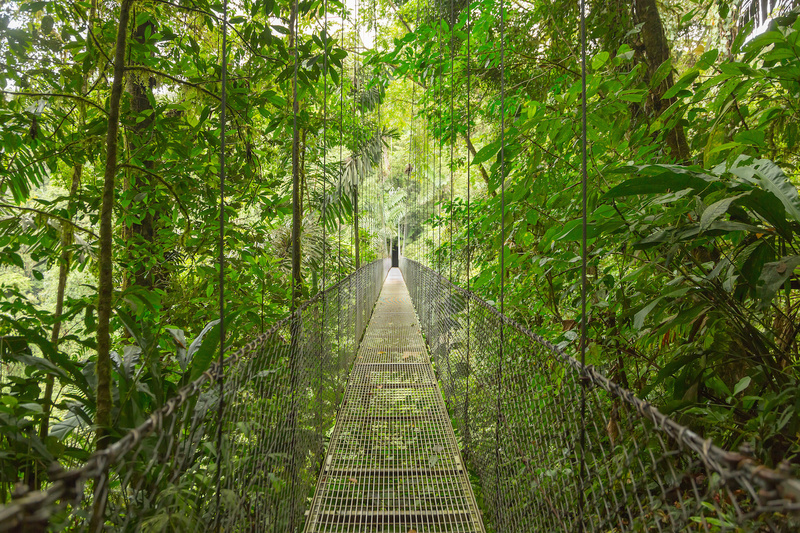 The tropical heat is replaced by cool, damp air you enter the Monte Verde Cloud Forest, which hovers amongst the clouds and is home to 2.5% of the diversity on earth. Hike through the canopy along rope bridges and zip-lines, listening to the chatter of white-faced monkeys and the call of over 400 species of birds, including tiny hummingbirds and the rare Resplendant Quetzal, its vibrant turquoise and scarlet plumage making it the most sought-after sighting by birders. Surf Breaks and Bioluminescence: Surf some of the best breaks in the world. Costa Rica’s surf is legendary, and a yacht charter along the Pacific Coast allows you to surf some of the world’s best breaks, whether at Nosara on the central coast, or Pavones in the south, home of some of the longest breaks in the world. After a day of surfing at Pavones, kayak or paddleboard through the bioluminescence at Zancudo for a moonlit paddle you’ll never forget. If you’re cruising the Caribbean coast, Puerto Viejo is the heart of the surfing scene there. 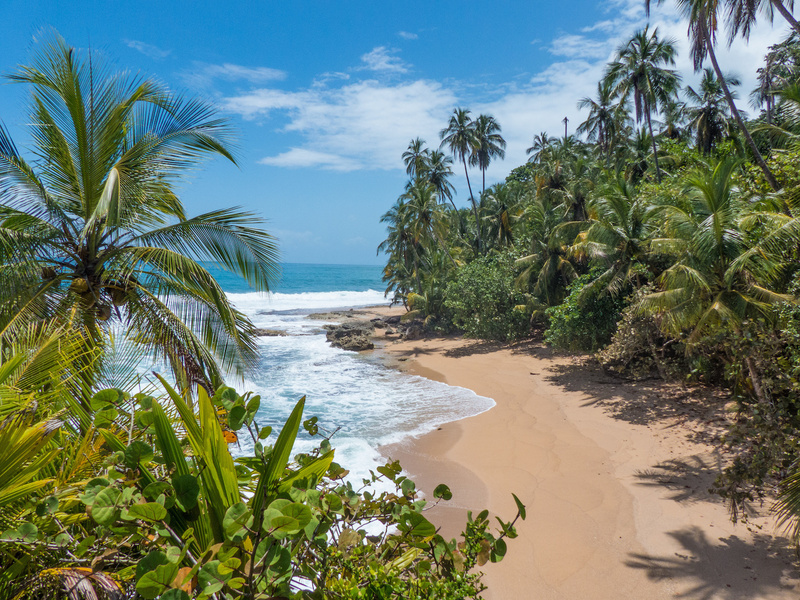 The Pacific and Caribbean coasts of Costa Rica are less than 200 miles apart, meaning that you can take a scenic helicopter trip across breathtaking volcanoes to touch down on the Caribbean coast for a day. We strongly suggest you visit the magnificent Tortuguero National Park to kayak through the flooded forest, looking out for sloths, sea turtles, and giant West Indian Manatees in the quiet canals. Given its fabulous combination of luxury resorts and wilderness adventures, a Costa Rica yacht charter offers the best of all worlds.